We’ve partnered with Stella Artois to host Genius Recipes dinners in some of our favorite cities across the country. Today, our Art Director, Alexis Anthony, shows you three quick flower arrangements to top off your table. Our Art Director Alexis shows how to build three different centerpieces. With flower arranging comes choices, especially when you're taking on the task yourself. Peeking into a cold case full of unfamiliar blooms and buds might initially leave you saying, "But how? What? Why? And should I use twine?" But we like to think that it just takes a few flicks of the wrist (supplemented by a little help from a professional). "This arrangement is one of my favorites because it celebrates the beauty of both the individual stems and the bottles. Placed together, they create an arrangement," Alexis says. As for the flowers, you can use whatever you like—however, wildflowers and greenery are particularly stunning. 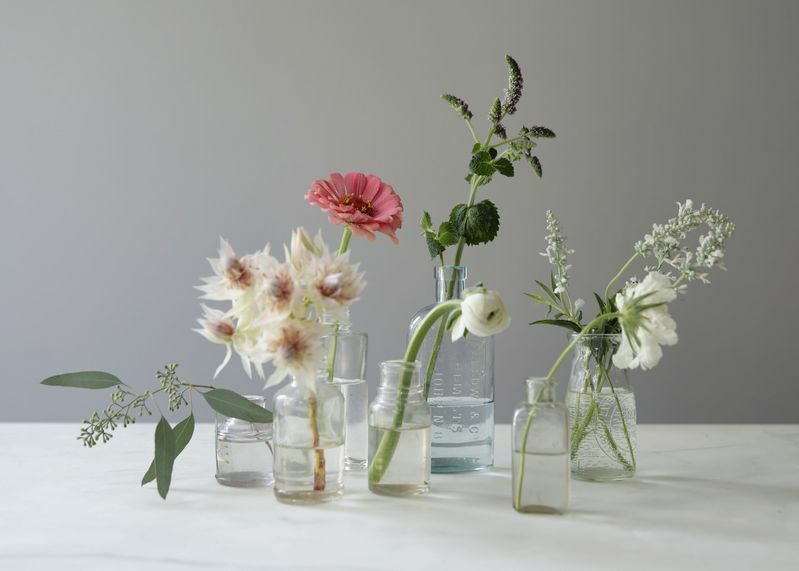 Use bottles with tapered necks to give the flower stems a little support. 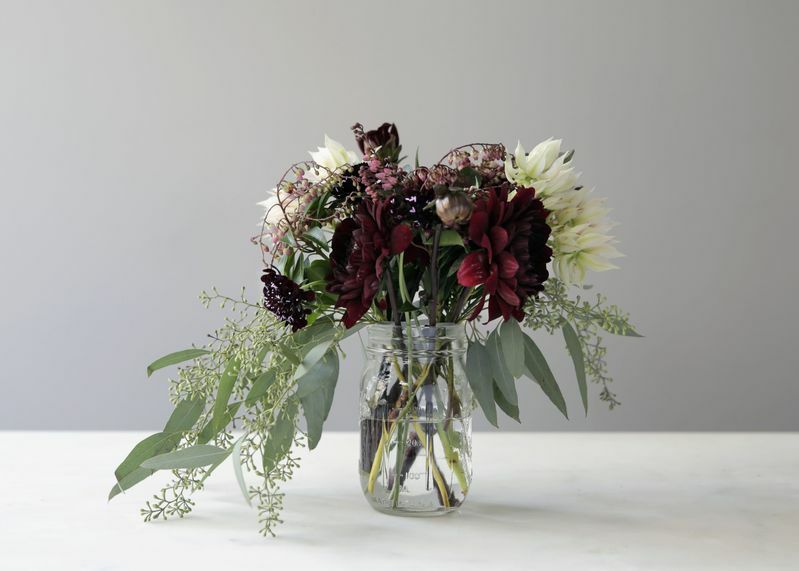 A variation on the first, this arrangement takes individual bud vases and ties them together with twine. This time, Alexis used three different blooms and three different bottle heights. "The bottles do the work of a traditional flower frog, keeping the blooms in place," she says. The last one incorporates five different stems in one arrangement. Seem like a lot? A little unstable? It's not! A tape criss-cross serves as the support. 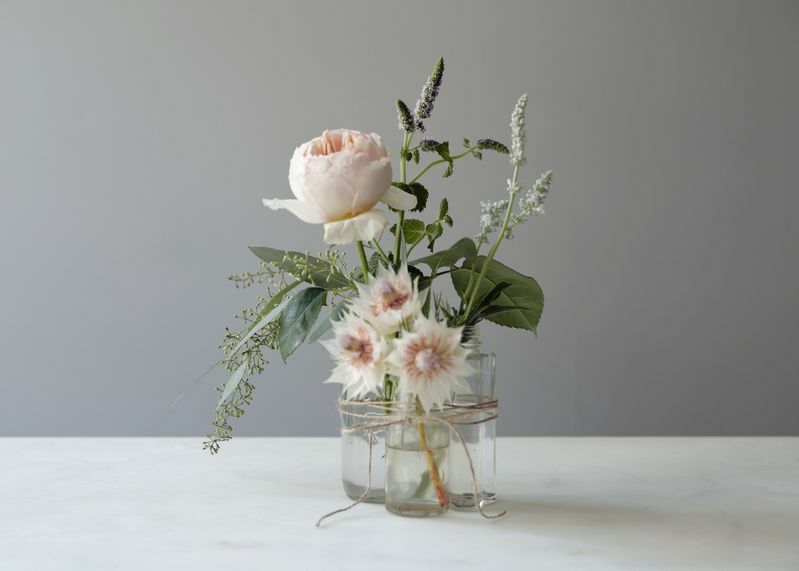 "This arrangement works well for a table setting because it doesn't block sight lines," Alexis says, and you can use almost any vessel, like a small Ball jar. "When looking for color schemes, you can't go wrong with combinations found in nature." Celebrate whatever grows in your area. "One of the most important tips for any arrangment is to cut the stems at 1.5 to 2 times the height of the vase." Strip leaves from stems below the water line to extend the life of arrangements. To learn more about hosting beautifully with Stella Artois, head here, and use the hashtag #hostbeautifully to share photos and tips from your own dinner parties.